Source: David Armano "Social Business by Design"
My first corporate position carried the title Methods Analyst, working for a large billing center serving a telephone company. One of my main tasks in that role involved learning how other employees performed their work and documenting it. On each project I typically spent several hours observing people work (what some today call rapid ethnography or guerilla ethnography) and then did in-depth interviews of the people I observed. Usually, at the end of my observation, I took responsibility for doing the work for a brief time under their watchful eye. In some sense you could say my work required me to continuously cross train in other people’s work, analyze the process, and write it up in a technical document. The main insight I took away from that experience was an appreciation for the importance played by empathy in effective collaboration. First off, collaboration isn’t just about people sharing information to achieve common goals. Collaboration is about people working with other people to achieve common goals and create value. Advocates of Enterprise 2.0 sometimes make the fundamental mistake of arguing that collaboration is really only about achieving business goals, leaving the implication that incorporating social software into the work flow of organizations is sufficient. Even though goal-orientation is a big part of collaborating, collaboration requires more to achieve goals effectively. It requires shared experience. As Dev Patnaik and Evan Rosen recently noted, empathy and collaboration go hand in hand. The emergence of social media provides people inside and outside organizations with a way to actively speak about, speak to, and engage the product and service offerings of enterprises. Currently, 25% of search results for the World’s Top 20 largest brands are links to user-generated content and 34% of bloggers post opinions about products & brands. Enterprises, on the other hand, listen to, engage, and act on insights gained from social media. Channels, policies, processes, touch points and transactions are increasingly viewed as parts of the social experience organizations use to encourage employees in collaboration (also known as — Enterprise 2.0), and engage customers in conversation (also known as — social media) for the purposes of innovation and transformation of the business. The common goal of the ongoing discussion involves transforming business practices to incorporate social relationships into the value proposition to customers and other stakeholders. Integrating engagement into enterprises is crucial to strategic efforts to use social software throughout an ecosystem, inside and outside the formal organizational hierarchy, as social business design. My contention is that such integration is most likely to succeed with a focused approach to informal learning. In my last post, Scalable Learning and Learnscapes in Social Business Design, I offered the following point. The concept of learnscape is a useful framework for thinking about the strategic challenge to the range of learning activities occurring as companies attempt to create feedback loops between their brand experience and the functional areas of their enterprise, especially in regard to the multidisciplinary collaboration needed to make these efforts successful. About a month ago I read What Would Andrew Do?, an unbook by Jay Cross and friends. I’ve mentioned Jay’s work in previous posts dealing with elearning 2.0 and collaboration in informal learning. In particular, its important to remember that focusing on informal learning doesn’t mean we must disregard the relevance of formal learning because learning is never 100% formal or informal. However, the term scalable learning probably does require a bit of clarification. After all, isn’t elearning supposed to scale to the size of the learning group and remain available when they need it, where they need it, as long as they are connected to the Web? Well, yes–and it does pretty much. Nevertheless, instructional designers too often fail to incorporate emergent learning requirements of the organization, the enterprise, into their learning architecture largely because the approaches used to evaluate learning content (whether elearning, blended, or instructor-led) do not incorporate assumptions about the larger ecosystem’s need for the co-creation of knowledge. The concern for whether the learner is exposed to every thread of content in every course, and assessed for mastery of the information, tends to predominate design thinking about learning, and for compliance training sometimes this is required. However, too often, instructional design fails to focus on whether the learning scales to support the learner’s ability on-the-job to recognize a problem as a particular kind of problem, much less provide the ability to find the learning content that provides a solution. I don’t intend to delve here into the minutiae of distinction possible between types of learning. Suffice it to say that when a learning architecture supports all types of learning along the range of formal, non-formal, and informal experience, it must design formal learning in small enough chunks to serve as resources for non-formal and informal learning activities. It also means that the knowledge created using non-formal learning (whether mentored or accomplished in collaboration with peers), or informal learning taken on its own, needs to become a performance resource in developing new formal learning content. 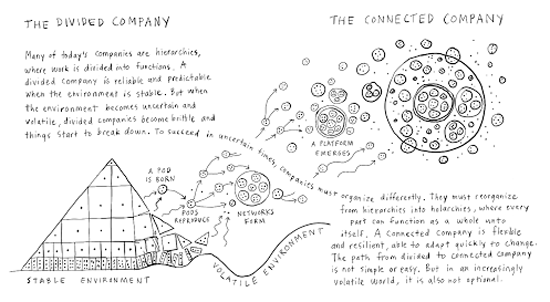 Jay contends that the performance challenges facing organizations are most aptly conceptualized as a learnscape, a concept initially articulated by John Seely Brown and Paul Duguid. In the August 2009 issue of Chief Learning Officer magazine, Jay offers the following synopsis. Learnscapes are the factory floor of knowledge organizations. The “scape” part underscores the need to deal at the level of the learning environment or ecology…The “learn” part highlights the importance of baking the principles of sound learning into that environment rather than leaving it to chance. The participants that Hagel, Brown, and Davison refer to consist of consumers, customers, partners, and employees using social media to talk about, talk to, and engage the products and services, i.e. brands, that an enterprise markets. Don’t misunderstand the focus on performance in the discussion of scalable learning. It isn’t about the traditional focus on efficiency, pursuing ever leaner processes for the sake of officially recognized best practices. Rather, the focus is on creating the knowledge needed to adapt to emergent challenges and manage the flow of that adaptation through the enterprise’s ecosystem. For learning architecture it begins with understanding the importance of keeping the focus on distinctions between push and pull learning. You are currently browsing the archives for the Enterprise 2.0 category.